" Love the new mask. Easy to get on and easy to release the hose for quick trip to bathroom. " " So far much much better than the mask before this. Much improved. " The AirFit™ F20 For Her Full Face CPAP Mask with Headgear is an updated style in the ResMed AirFit™ Series. This mask offers the InfinitySeal™ cushion, which is designed to maintain a strong seal regardless of pressure ranges. The smaller cushion sizes and insulated Violet headgear are specifically engineered for the female CPAP user. This mask features a full face cushion, covering the nose and mouth. 18% of Full Face Mask product buyers choose this product. ResMed's AirFit™ F20 For Her Full Face CPAP Mask with Headgear uses a flexible, padded frame to provide a comfortable hold throughout the night. The InfinitySeal™ full face cushion attaches to the frame, extending from the bridge of the nose to below the mouth. When positioned correctly, the seal is intended to withstand any pressure in order to maintain a strong seal. The frame provides open visibility and allows its users to read or watch TV before falling asleep. The position of the AirFit™ 20 Full Face mask is maintained without the aid of the headgear support, creating an open view for CPAP users. Bedtime activities such as reading and watching TV are simple once again. The AirFit™ F20 is also a good mask choice for those who find themselves suffering from claustrophobia as the flexible frame spreads like wings beneath the eyes and above the ears. From the bridge of the nose to the top of the forehead, this mask provides a wide range of vision. InfinitySeal™ technology is implemented into this cushion to reinforce the seal of the mask throughout therapy, regardless of the pressure. The AirFit F20™ cushion pairs with the newly designed frame which is intended to fit a number of different face types and structures. Together, the InfinitySeal™ and frame work together to help improve CPAP results. This mask features a padded headgear design extending above the ears, over the crown of the head, and downward toward the base of the head. The AirFit™ F20 For Her is specifically designed with feminine touches as it is offered in a pleasant, Violet color. This minimally invasive headgear is made of lightweight materials and serves as an additional comfort feature to the mask. Magnetic headgear clips connect the bottom headgear straps to the base of the cushion. The clip allows the user to easily disengage the mask without destroying the fit. The AirFit™ F20 elbow fastens to a round air tube which hosts a multitude of tiny holes used to diffuse noise as air exits the mask. This process is intended to make CPAP therapy quiet and enjoyable for the user as well as their bed partner. The elbow serves an additional purpose as it connects the mask to the CPAP hose. The AirFit™ Series elbow has a quick release feature allowing the user to remove the CPAP hose quickly and efficiently, if needed. If you rise in the middle of the night, slide the CPAP hose from the base of the elbow, and leave the mask in tact. 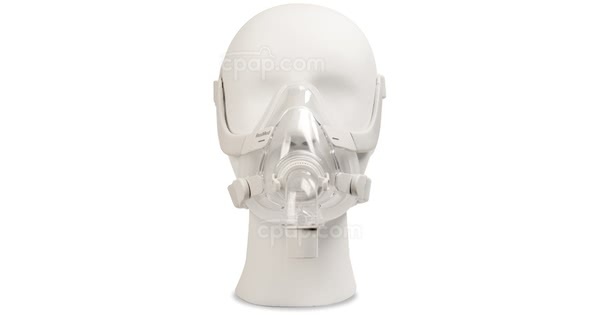 Looking for the blue AirFit™ F20 CPAP Mask with Headgear? Remove all packaging from the mask, headgear, and elbow. Detach the magnetic headgear clips from the base of the cushion, if applicable. 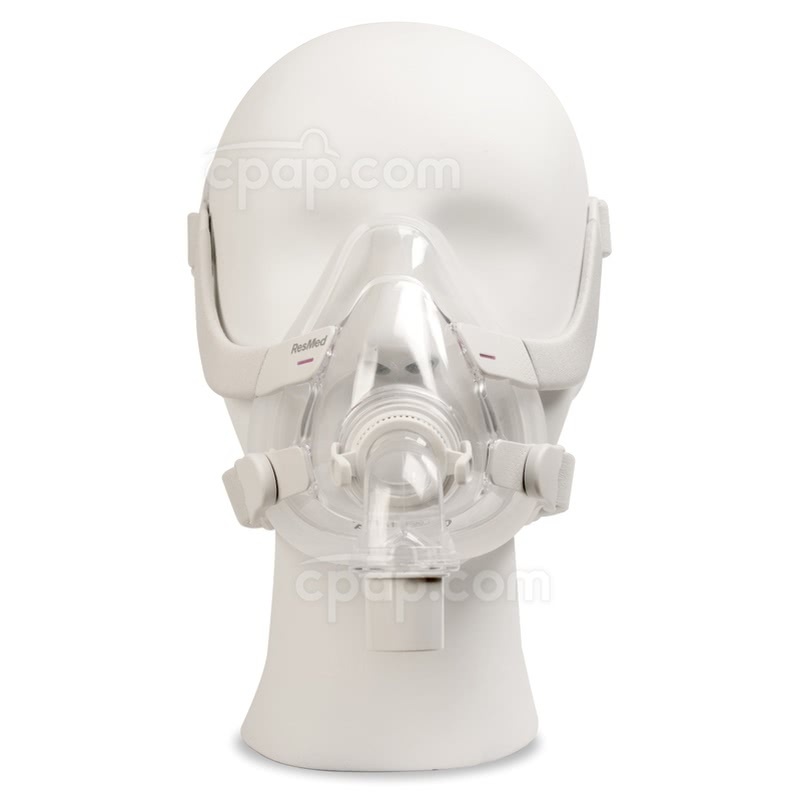 With the headgear attached to the mask frame, pull the mask over your head with the ResMed label facing outward. Before the mask settles on the face, move the cushion around to ensure it is fitting properly on the bridge of the nose. With the cushion positioned, pull the lower headgear straps toward the mask and connect the clips to the blue magnet. Note: The lower headgear straps need to fall below the ears. Lift and pull the tabs located at the top of the headgear to apply or loosen tension for a secure fit. Re-attach the tab to the headgear. Then adjust the bottom headgear straps in the same manner, if needed. Join the air tube and elbow together to form one piece. Insert the elbow into the round opening on the full face cushion, and attach the CPAP hose to the elbow. At this time, the Standard HumidX™ or HumidX™ Plus are not compatible or available with this mask. The manufacturer issues the following statement in the product user manual: "Magnets are used in the lower headgear straps and the frame of the AirFit N20. Ensure the headgear and frame is kept at least 50 mm away from any active medical implant (eg, pacemaker or defibrillator) to avoid possible effects from localized magnetic fields. The magnetic field strength is less than 400 mT." When washing the headgear and frame, squeeze them to ensure all soapy water has been rinsed out, and also squeeze after rinsing to eliminate excess water before drying. The frame is one size; therefore, a size indicator is not found on the mask frame. The cushion size is printed below the round opening on the mask cushion. A printed black circle with a white letter represents the size of the cushion. The letter S represents a Small cushion, M represents a Medium cushion, and L represents a Large cushion. The manufacturer ships the AirFit™ F20 in a box rather than a traditional sealed bag.